Caption slip reads: "Photographer: Pacific Press Phtos. Date: 1951-06-11. Reporter: Gaze. Assignment: Record trout catch. Only negative enclosed: Clyde Fitzgerald, (city sanitation inspector, Santa Monica) with 16 pound, 6 1/2 ounces Lochleven (German Brown) trout which he caught trolling at Crowley Lake over weekend (Saturday). It is 1951 record so far and just 3 pounds lighter than all-time Crowley record, he sez.. It took 1 hour, 20 minutes to bring to net, towed lite boat with outboard motor in big circle. 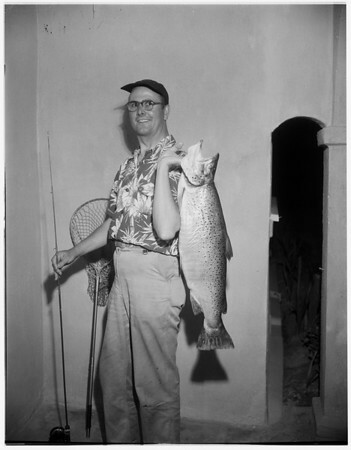 Fitzgerald's fishing partner: Maurice King, Santa Monica City engineer, who caught 6 trout. Fitzgerald caught 2 others".